We also offer several basic models of Portable Air Heaters for a wide variety of common applications. For more information about our Portable Air Heaters, please visit the Portable Air Heaters web page. Be sure to visit our Portable Industrial Air Heaters web page for information on our direct fired industrial air heaters. Industrial Direct-Fired Gas-Only Air Heater — This low temperature air heater (1000°F maximum) is excellent for use in a corrosive atmosphere. Fabricated of stainless steel and coated with a protective finish, the industrial air heater's gas train is located in a fiberglass box (left) with windows for quick and easy viewing of safety valves and pressure gauges. All controls are located inside the electrical panel (right) which also features a window to allow convenient monitoring of temperature and burner equipment status. 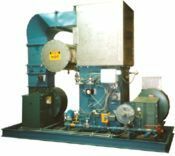 Indirect Gas-Fired Air Heater with heat exchanger (30,000,000 BTU/H) for temperatures up to 1,600°F — This indirect air heater is suited for the manufacture of sensitive or volatile materials. 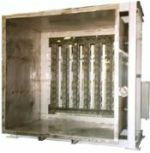 Direct Fired Stainless Steel Gas-Only Air Heater (48,000,000 BTU/H) for temperatures up to 1,700°F — This direct fired air heater is corrosion resistant and is particularly well suited for use in the food, chemical, and pharmaceutical industries, as well as use for foil stamping, fluid bed drying, and film laminations. Prepackaged Direct Fired Stainless Steel Air Heater (9,500,000 BTU/H) Assembled for easy transportation and installation. Control Panel and Pipe Train can be remote mounted similar to this unit, or added to the air heater's framework. High Temperature Direct Fired Stainless Steel Air Heater (12,000,000 BTU/H) for temperatures up to 2,400°F — This refractoryless air heater is gas/oil burning and is a high value/low maintenance replacement system. In addition to industrial mill applications, this direct fired air heater is often used for the drying of gypsum. Direct Fired High Temperature Air Heater for temperatures up to 2,400°F — This refractory lined, high temperature air heater is gas/propane burning and a skid mounted 'package' unit. 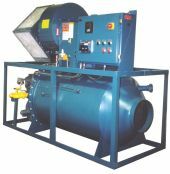 The air heater is frequently used for spray drying.